Sunrise is the program designed for preschool aged children (2-3). These music lessons are designed to teach basic rhythm, music vocabulary, singing, and listening skills to preschoolers while exposing them to a music class environment. The Sunrise program will provide an introduction to the exciting world of music to your young child. The program includes 3 progressive blocks each covering a 10 week term. Music classes include singing, rhythm instruments, rhythm reading, crafts, listening activities, dancing/actions, and more singing! 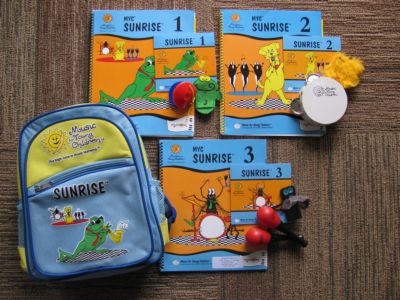 Sunrise has three music friends that help introduce rhythm and songs to your young child. Buddy Croak is a saxophone playing frog, who is the leader of the Sunrise Band. Mellow Yellow is a yellow dog who is the singer/dancer in the band. Buzz is a zippy little fly with an unusual talent for playing the drums. Come join Buddy, Mellow, and Buzz to begin a fun musical journey! I will be offering new Sunrise classes beginning in September 2019. Contact me today to reserve your child a spot! The cost of each 10 week music session is $175 plus a registration fee, which includes a workbook, rhythm instrument, finger puppet, and a CD. It even includes a backpack to carry all your music goodies to class! The workbook includes craft pages and sticker activities, as well as the music and lyrics to the songs we sing in class. Each song in the workbook also includes extra ideas of things to do with the song at home, including ideas for babies and older children.